My feet have always been flat, but I started doing flat foot exercises when I started getting pain in my feet from standing for long periods of time and from a pain in my hip when hiking and running. Unfortunately, our feet flatten out more as we age. The bones flatten, not only from gravity, but also from loss of strength in our arches from wearing supportive shoes for most of our lives. Arch supports in shoes are helpful when you have to stand or walk or be on cement for long periods of time. I also buy narrow shoes so my feet do not slip around and are supported more. 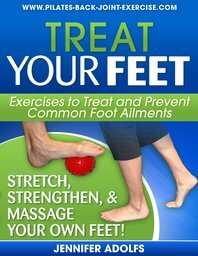 Find many of these and more flat foot exercises in my new Foot Ebook here. Find out more about how to use the foot corrector and arc up your flat feet and arches here in this video I've made for you. 1. Using a Pilates Foot Corrector or doing similar work with a small ball. Using the foot corrector or positioning a tennis or small ball in the position under the ball of your foot, begin pressing through the toes and ball of the foot moving the saddle down, then lift your toes and repeat. Grab and release the saddle or ball with your fore foot for 15-30 repetitions keeping the rest of your body still. The work is in the foot, ankle, and lower leg. Stabilize from your pelvis to keep your body from rocking forward and back. 2. Walking barefoot helps to build the arch, don't over do it, and only do it on natural or soft surfaces, not concrete! 3. Foot arch exercises such as the inchworm shown below. Practice the inchworm by inching forward pulling the arch of your foot up and then flattening the foot and curling your toes up as you inch forward some more. Go as far as you can before getting cramps in your arch like I do. Find more foot strengthening exercises from this page. 4. Plantar and dorsiflexion of the foot using a stretch band. Creating tension on the band practice pointing and flexing your feet stretching and strengthening the muscles of the top and bottom and of your feet. 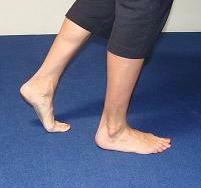 This flat foot exercise can be done standing on one or both feet to strengthen the arches and calves. Roll through your foot up to the ball and toes, and then slowly roll the foot back down through the heel. Repeat for 10-20 repetitions or to fatigue. Find out why your feet hurt and what to do for them here.